A while ago I came upon a photo of an art installation titled Deceased Estate 2004 - a collaborative exhibit by Sydney artists Sean Cordeiro and Claire Healy. It got me thinking about precisely how many "things" an individual can manage to accumulate over an entire lifetime. Between amassing items of absolute necessity and those collected purely for their aesthetic or sentimental value, the numbers must be staggering. But Cordeiro and Healy's work here has allowed us to take a step back for a moment, and see the fuller picture... all those treasured objects and favourite items that each of us covet, are really just mundane articles that perhaps may not be looked upon by the next person with the same adoring eye. And then what of it all when we are dead and gone? I imagine unless specific measures are taken, much of it will be picked over by relatives, and the rest sold off in estate sales. Ive always felt sad when thinking of personal possessions lost to the corridoors of time. 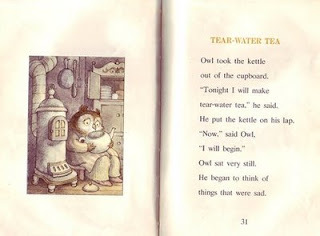 As a young boy I often felt the sting of tears behind my eyes when reading Arnold Lobel's book Owl at Home - in particular, a tale where Owl wanted to make "tear-water tea" by crying into a kettle. He thought of all the things that bought sadness to his heart - like pencils sharpened too short to ever be used again, or lost spoons that have fallen behind the stove and are never seen again. He soon manages to fill the kettle with tears and makes tea that is "a little bit salty", but "always very good". 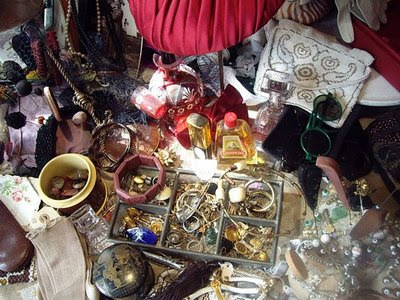 It is still with this wistful sense of melancholy that I look upon personal treasures that are sold off after a death. It is all so finite. How easily ownership is transferred with the swipe of a card or the clatter of coins. Just this past weekend I found myself faced with such a situation. After trawling the wonderful fleamarkets of Copenhagen, I chanced upon a delightful vintage store hidden away in a charming side-street. 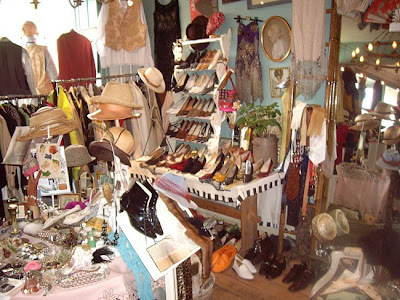 Inside, it was fully stocked with anything and everything one might imagine - clothes, hats, shoes and luggage from the 19th century to the present day... costume jewellery, ornamental objects, vanity items and vintage perfumes. All of it endearing, all of it authentic, and all of it acquired through deceased estates. I sifted through hat-boxes stuffed with antique milliner's ribbon, rummaged in drawers brimming with monogrammed linens and peered through glass cabinets holding flacons of perfume both exotic and rare. My heart raced a little - after all I do enjoy my vintage perfume finds - but I thought for a moment about the individuals that might have once possessed the vintage Robert Piguet, or still-sealed bottle of Guerlain's Nahema. 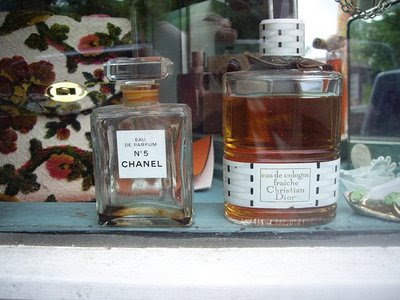 I thought about these scents sitting on mahogany dressers or in paper-lined cupboards, and wondered if they were received as gifts from an adoring suitor, or purchased, after many months of saving, as a decadent personal treat. I felt almost guilty unscrewing bakelite perfume lids and sniffing at dusty talcum-powders - as though I were somehow intruding on someone's personal ritual. It was difficult to imagine that the person whose body had been generously anointed with such perfume was now, well... in actual fact, dead. In a way, it was almost enough to have me reaching for my own tin tea-pot and turn on the waterworks, just as Owl had done in his book. An hour or so later, I walked from the store with several perfumes nonetheless. I thought about what would be sadder: to take ownership of articles pre-loved and appreciated by some dearly departed; or to leave the fragrance to 'turn' in the shop window, and their boxes to fox and fade. Just like their anonymous original owners, I felt it better they be remembered and appreciated, rather than forgotten. What a great story!! WOW and what a sad book, I now want to read it. Thank you for great poest. 'Owl At Home' sounds adorable. So true - I find thrift stores and garage sales a little bittersweet and wistful myself. Last time I had my own garage sale I sold a favorite lamp of mine to a woman who promised me she would take care of it and put it in her little boy's room. I almost teared up right there on the sidewalk, watching her walking away with it to her car. Oh no ..that was a huge favourite of my daughter and it is somewhere in the house so I'll have to find dear owl or I won't sleep. Just so delightful & eloquent Dimitri! nice going on the eau fraiche tho! What an eloquent post. I've recently bought some estate perfumes from eBay and also felt kind of sad, like I was taking something from someone. But when I think about my perfume collection, I very much want someone else to use it up when I can't. I don't have a willing heir for most of my perfume, so it will probably be sold off the same way. What a beautiful, melancholy post. It has made my day. We are in the process of going through our late parents' belongings and we will both be much happier knowing the objects they collected and held dear will find a new life, not ending up as junk on a tip. Hi Anonymous, Im sure its not an easy thing to have to do, but yes, there is some small comfort in knowing some of these treasured items will be cherished for ages to come. All the best. Wonderful post. I feel the same, as an avid thrift shopper; I have accumulated a lot of stuff over the years, I'm sure I'll keep going until I die, and when I do I'd far rather have all those things go to someone who appreciates them than just being thrown away or collecting dust in a cupboard somewhere. Sometimes I even see my thrift shopping as a sort of salvaging of dead people's lost belongings. I bought a portrait of a four-year-old boy the other day, dated 1937, that made me think along those lines. I assume that the portrait must come from a deceased estate, either his own or someone closely related to him, and while the portrait is self is sentimental bordering on the kitschy (which is a quality I tend to enjoy, in all fairness), I really liked it. I just couldn't quite bear the thought of letting it hang there in a fleamarket, among all sorts of mundane, uninspired junk, so the portrait of Sven Olov has found a new home. That's what I hope for when it's time for my own things to be disposed of.